Today I want to tell you about a problem or bug on the iPhone that can prevent you from using your cellular data. If you recently switched wireless carriers and put a new SIM card in your iPhone only to find out that you are unable to use cellular data with your new carrier and see the message Could not activate cellular data network Turn on cellular data or use Wi-Fi to access data. when you try to use data you might be a victim of this bug. Normally you see this message when the APN is not set correctly. The Access Point Name (APN) settings are several settings that tell your iPhone how to connect to your carrier’s cellular data network. In most cases when you insert your SIM card, your iPhone automatically sets up the APN for you. Sometimes, you need to go into your iPhone’s settings and enter the APN yourself, but with the latest versions of iOS the iPhone usually sets the APN automatically. Once your iPhone sets the APN automatically, it disables or hides the APN setting page and you can’t view or change it. For some carriers this is a problem. The way carriers work around this is by having you install a Carrier settings profile. Your carrier provides a web link to the APN profile, you download it with Safari, and install it. Once installed the APN is set and you can use your cellular data. When you switch carriers, you go into Settings and delete the the old APN profile. Here is where the problem starts. 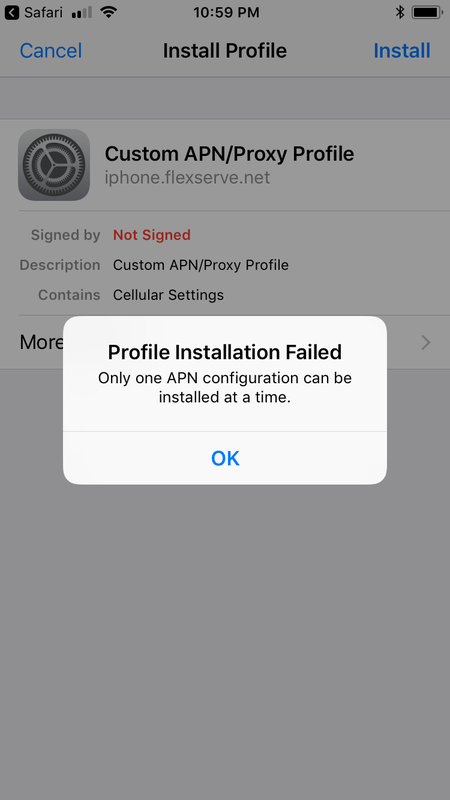 With the later versions of iOS 10 and all current versions of iOS 11 (iOS 11.4 currently the latest), there is a problem with some of these APN profiles. The iPhone won’t show you the installed profiles, so you don’t know that you have one installed and you cannot remove it. When you switch to a new carrier, that old profile is installed, your APN is set incorrectly and you cannot change it. Your only two choices are to completely reset your phone and start over fresh or use a special Mac or Windows app to backup your phone, delete the profile from the backup, and restore your phone. Before getting into the details of fixing the problem, I’ll describe the problem in more detail. If you are using Tracfone, Straight Talk, Net10 Wireless, or other Tracfone brand wireless service you may encounter this problem because they required you use an APN carrier profile. If you installed the profile when your signed up and later updated your iPhone to iOS 10 or 11, the profile disappears from the APN settings. 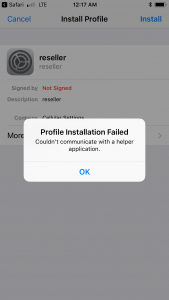 If you try to install a new profile to replace the existing profile, you’ll see the error message Profile Installation Failed One one APN configuration can be installed at a time. If you were to install one of these APN profiles today for the first time the installation would fail. 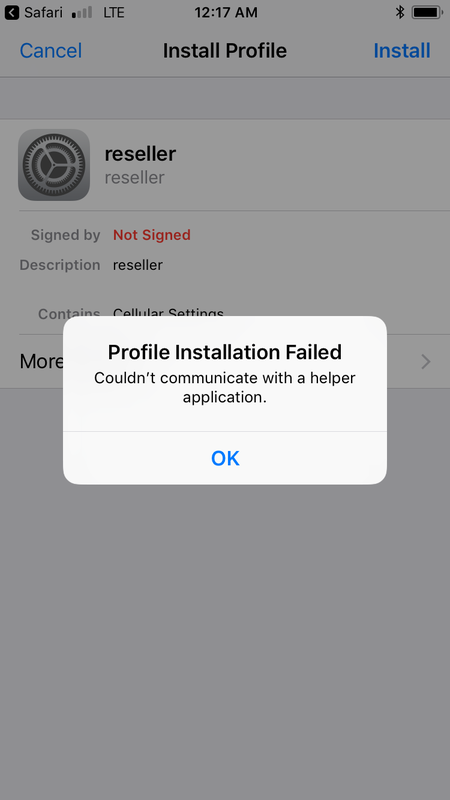 You’ll see the error message Profile Installation Failed Couldn’t communicate with a helper application. Even though it says the installation has failed, an APN profile is installed and you cannot see or remove it. This seems to be the case with many older profiles for different carriers. It appears that some of the new profiles include additional settings and do not have this problem. Most carriers however don’t update their profiles often though, so many older ones do not work properly. To fix this problem you have two choices. First, you could completely reset your phone as new. That will fix the problem. However you can’t restore a backup of your phone because it will restore the old profile as well. This isn’t a great solution if you won’t want to lose all your data. Second, you can backup your iPhone, modify the backup by removing one file, and then restore your modified backup. Once restored the profile will be gone and you can use your data again. You can use iTunes to backup your iPhone, but you’ll need a Mac or Windows version of a Mac or PC app that will let you edit the backup. There are several such apps available. The apps are not free, but some offer limited functionality so you may fine one workd for you. I used a paid for version of iMazing. I’ll update this after I check to see if you could do all this will the free version. With iMazing, I located the file System Files/ManagedPreferencesDomain/mobile/com.apple.managedCarrier.plist in the file system backup and deleted it. After that, I restored the modified backup to the phone and I was able to use cellular data again. 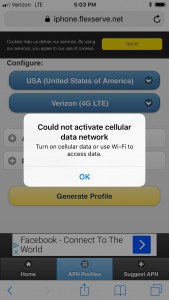 If you need to use an APN profile to use cellular data on your iPhone. I recommend you try http://iphone.flexserve.net. The profiles generated by this site install properly, appear in your iPhone’s settings, and can be removed. I don’t know for suse but I think the reason these profiles work is because they contain additional information that many other profiles do not. I suspect that is the cause of the bug. Apple really needs to fix this problem. Thanks to Randy from Washington for sharing the details and solution for this problem. I had the problem myself, but hadn’t had a chance to figure out the cause. Randy left a series of incredibly detailed comments about this problem. after deleting this file and restoring from this backup, It was working, thank you for the good work! interesting. May I ask what verison of iOS are you using? Several people have said they can’t find the file, so I’ll tell them to check that location too. Thanks for the comment. Can I restore the edited the backup via itunes? Or is there a free alternative app? I don’t know, you’ll have to try restoring from iTunes yourself. First backup to iTunes, then to imazing, then try to restore the imazing backup with itunes. If it goes wrong you still have the itunes backup. As for free, iBackupBot, maybe. I paid for imazing, I had a recommendation for I figured it was safe. There are a lot of free apps out there. I didn’t check them out. I was concerned with giving a random app access to my iPhone’s data. No one else commenting on the article or video commented on paying for imazing so I don’t know if the used the paid or free version or another app. I’d appreciate a follow up on what you ultimately decide. So i’m trying to follow this step by step as this is my last resort before getting rid of my phone but when I start to restore the backup in iMazing it says that there is not enough space on the iPhone to restore it. Im confused by this because its a copy of whats already on my iPhone… so it obviously fits. Please help! I don’t know. I’d check to see if you can restore your stuff incrementally looks like you can. Otherwise that is a question for iMazing support.